Now that the game is in Panda’s hands, I wanted to post an update that covered some of the tweaks we’ve made to the game since our last big rulebook update. 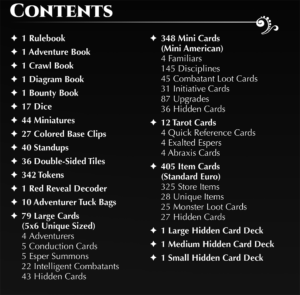 I’m sure for those who spent the time to read our massive rulebook twice, it’s pretty noticeable. However, we had some people asking for a comparison of what was different. So, to save them the time of doing another read through, and to preview some of the changes for our backers, we decided to do an update that compiles the updates. But first, some general updates. We’ve decided that moving forward, we won’t have a project this late again. The time it’s taken us isn’t financially feasible, and moreover, it’s also very unfair to our backers to have to wait so long to receive their product. Once this game delivers, we hope that you love the hard work and dedication we, and many of our backers have put into it. We also want to apologize for the long wait time, and promise to avoid such tragically long turnaround times on future product. We feel that the audio book is an important part of the experience we hope players share. The sheer amount of words required to read aloud in our game is staggering. For this reason, we’ve reached out to numerous voice actors to complete our audio book. This foray into the world of voice acting has been pretty eye-opening. The economics of the industry is something that I wasn’t very familiar with when I started. Since then, I’ve learned a lot about a whole different side of the publishing industry. In addition, I quickly found that nearly everyone who listens to audio books has a very, very strong opinion about what’s good and what’s bad. I had people telling me that Final Fantasy 10 had phenomenal voice acting with the next guy telling me it was hot garbage and ruined the game for them. I had people telling me that Harry Potter was impossible to listen to on audio book, or that Game of Thrones was ruined for them. And through the constant barrage of “Cowboy Bebop is the best anime ever”, I felt like at any moment two people at my local game store would start fist fighting over which anime had the best voice acting. I haven’t heard so much discord among fans of a single medium since working at a comic book store. The experience gave me insight into my own subjective opinions about various games, movies, and anime that I’ve watched. Since then, I’ve decided that I have very few quirks, and no matter who we got to do VO, someone will be furious with the decision. So, without further ado, we’ve decided that for stories with female lead characters we’ll try and use female voice actors. For stories with male leads, we’ll make an attempt to work with male voice actors. For Unintentional Malum: Act 1 we’ve decided to work exclusively with Julie Shields. She’s done some voice work for Borderlands 2, a game I love, and she’s also been charming to work with. When we get the audio book done for Pirates of Elenia, we’ll likely use a different voice actor, since it has a male lead. We’ve setup weekly meetings with Panda and will make sure to update you guys on any significant milestones we reach. Currently we’re working on samples for the etched dice and new samples of the cardmats. We hope to have an art book to show very soon as well. With our game finally out of our hands we’re moving back onto translations. Alex has prepared an intricate Google document to get the project done. We’ve already had enough people offer to help and will be reaching out to them soon. As soon as we have something to show off, we’ll make sure to update everyone. The pledge manager is currently closed, if a backer tries to use their old links it will no longer work. (We had some late backers sneak in) However, this means that you will no longer be able to update your shipping information without our help. We’ve had some backers ask so we will be sending out a last call for shipping information right before we ship. With the pledge manager closed, anybody still looking for the game is welcome to send us an email and we can get them on a Back-order list. We’ll be setting up a link on our kickstarter that will do this as well. We aren’t expecting extra copies for retail, but we’ll likely have extras for replacement parts and conventions. The pre-order list will be used by us to gauge desire for the product. Also, if we happen to have extra copies we’ll of course make sure to hit these people up. We weren’t completely satisfied with the text restrictions we had with such a small card size. 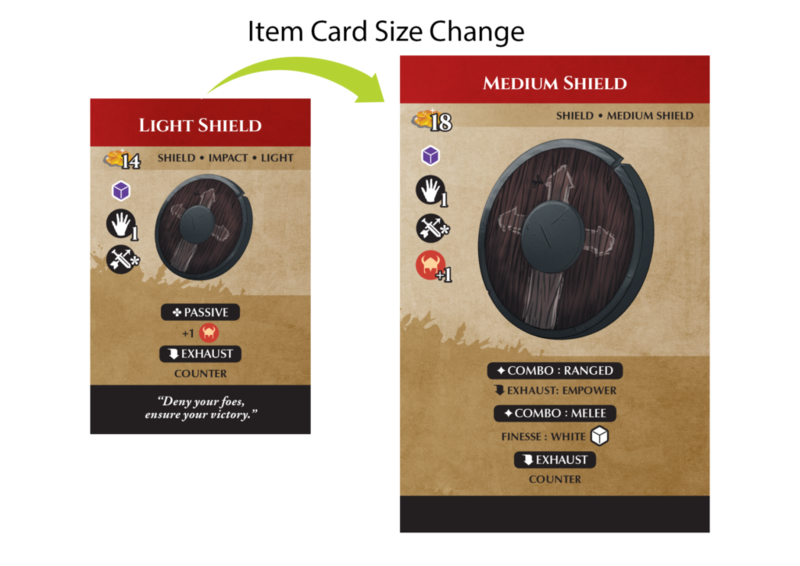 Making these item cards bigger allowed us to implement some of the more exciting ideas we had for equipment. This means that the card counts have changes as well. Below is the final component count printed on the back of the box. 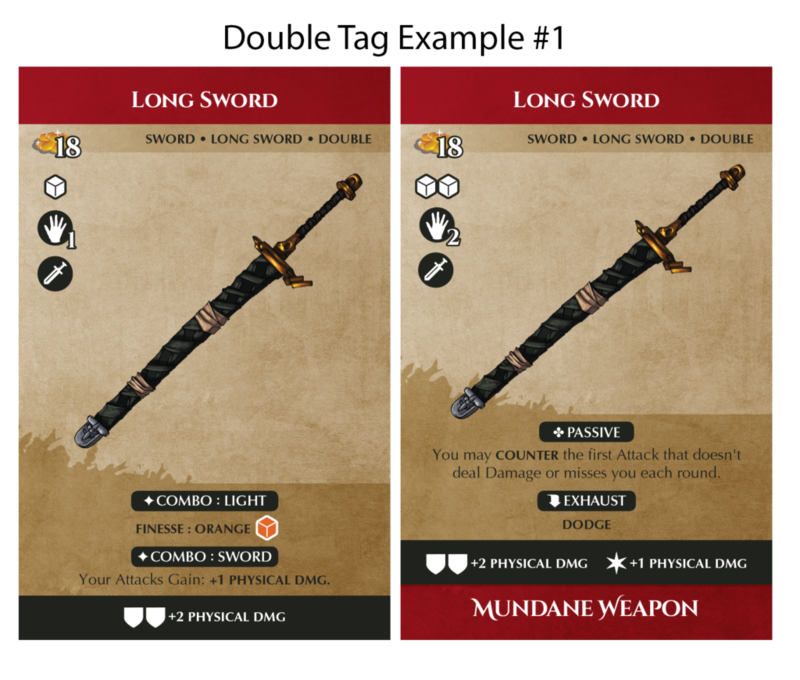 We ended up adding a lot of items to fill in the gaps so that, for example, if a player loved Long Swords, Maces, or whatever, they could have that option at all points of our game. We hated getting to higher tiers only to be in a position where a thematic or mechanical weapon combination wasn’t represented due to card limits and restraints. This change allowed us to remove those restraints and really make the games weapon system feel more JRPG-like. 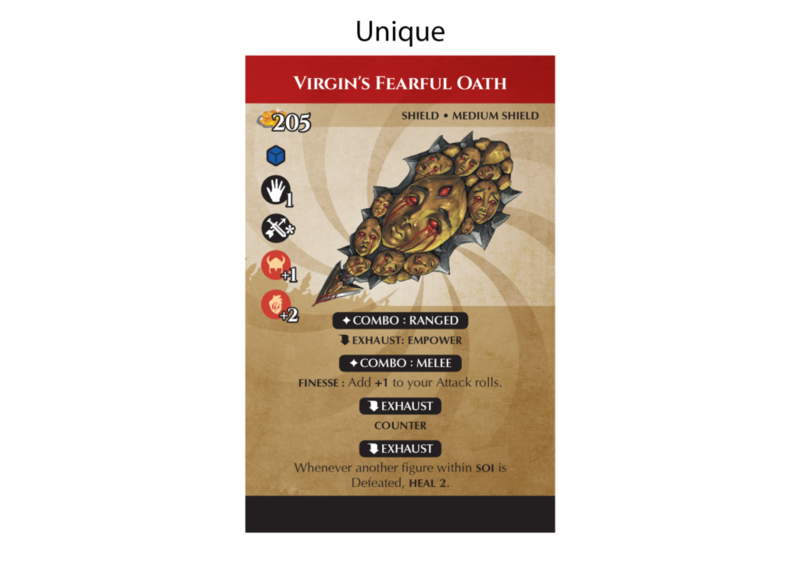 For example, above we show the Medium Shields available for sale in our game. Medium Shields are now available at all tiers but in different varieties. So, if a player is at one town buying gear versus another, the Medium Shields are different, but they have some mechanical uses that are expected among Medium Shields. This means that if a player really loves the base mechanic of Medium Shields, or simply thinks they are cool to use in combat, they will now always have the option to purchase them and make it mechanically viable. What weapon style do you guys usually play in games? Let us know in the comments! Technically we always had unique items, but they weren’t what players would expect or how we envisioned them. A Unique Item is an Item that isn’t for sale in most cases. Instead, these Items are something that you must find to acquire. This adds a sense of mystery and urgency to killing monsters for loot. 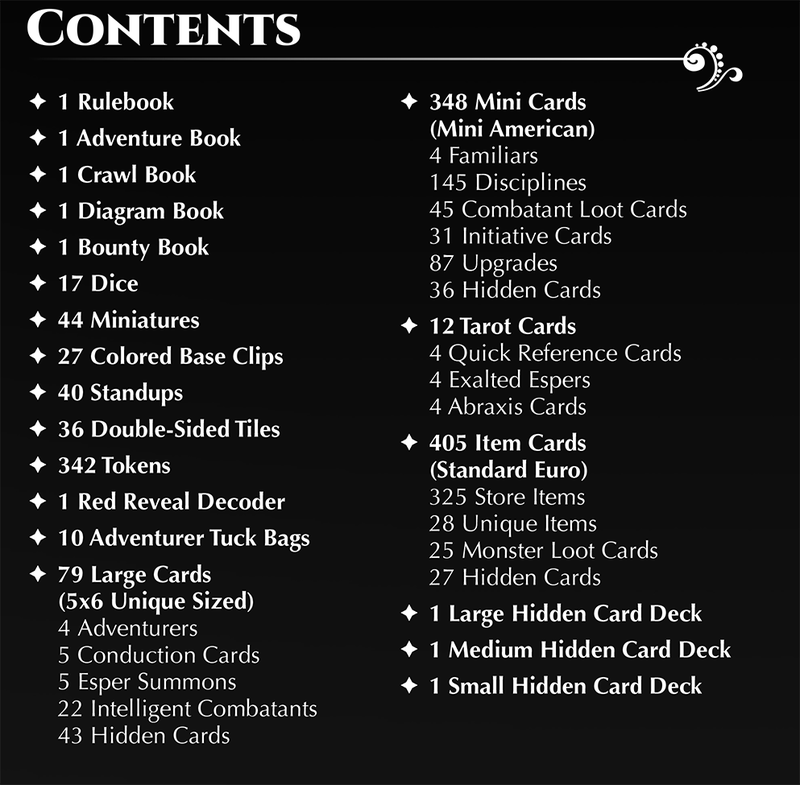 Now, each tier (Mundane, Common, Uncommon, and Rare) have their own specific Unique Loot decks. Unique items are the equivalent to “rare drops” in most RPGs and are typically very strong for their tier. For example, above is a Unique Medium Shield that can be acquired by killing monsters in the Rare Loot section of our game. A player that likes Medium Shields might prioritize killing these monster during an Encounter when he/she might otherwise be able to avoid them just for a chance of dropping this Medium Shield. 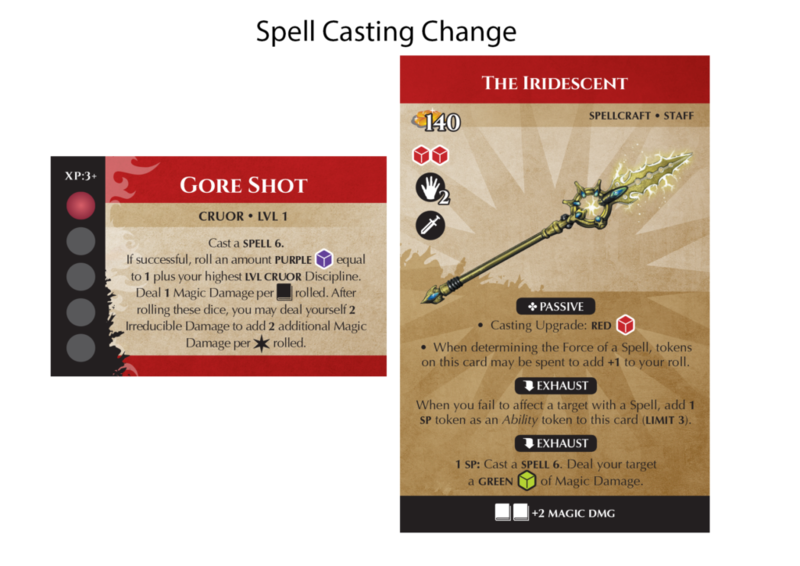 It’s not that we changed how Spells function, or changed their intent. Rather, we took feedback from our backers to make it more clear and more intuitive. This meant that we separated Spell Casting from making Attacks completely. Spell Casting occurs when players use an Ability that says “Cast a Spell X”. Above are two examples of Abilities that Cast Spells. One is a Discipline, the other is on a Staff called The Iridescent. Anytime a player uses an Ability that says “Cast a Spell X” They simply go through the Spell Casting steps. 3) The target then makes a Conviction Check against the Force of the Spell. 4) Resolve the Spell’s effect. If the target passes the Conviction Check, the Spell fails, otherwise the target succumbs to the listed effect. For example, an Adventurer equipped with the above Staff could Exhaust it and spend 1 Stamina Point to cast a Spell 6. The player chooses a monster to target, then rolls his/her Spell Casting Die and adds it to 6. Let’s assume they get an 8. Then, the target must make a Conviction Check of 8 or higher. If the target fails to resist the Spell, the player may roll a Green Die and deal that much Magic Damage to the target. Previously, everything that caused a Conviction Check was considered a Spell, regardless of its source. 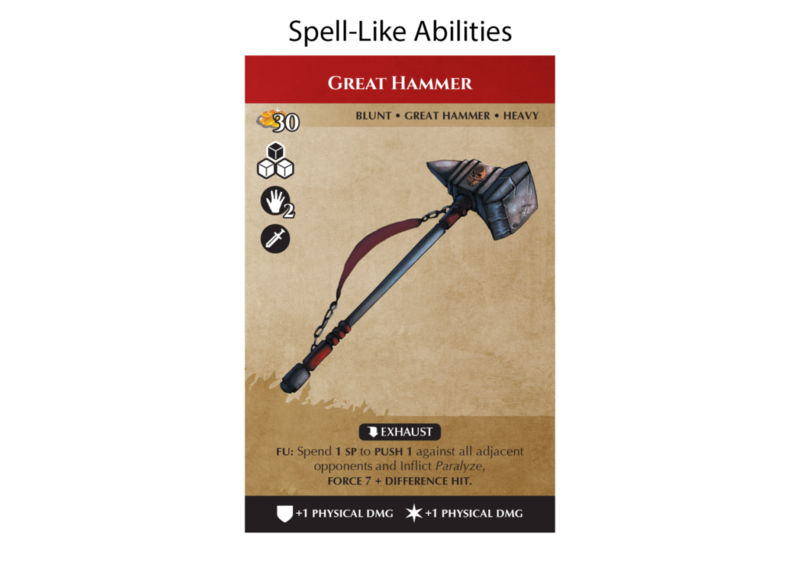 We’ve now made Spells their own thing. They use their own equipment, gain their own bonuses, and can be augmented using Disciplines and Items that reference “Spells“. Spell-Like Abilities on the other hand, are Abilities that require Conviction Checks but aren’t considered Spells. Many Disciplines in the Martial tree now require Conviction Checks, but do not benefit from Items that were never intended to benefit them. In addition, this made our Spell Casting players feel more special as their builds are uniquely different. All Spell-Like Abilities are used as Follow Up Abilities, meaning that they are always used at the end of an Attack that hit an opponent. The above example shows a Great Hammer. This weapon has a special Spell-Like Ability that pushes all adjacent figures away 1 space. The Force Value each opponent must make to resist this movement is 7 + the difference in which the player hit their initial target by. This means that if a player rolls really well, they have a good chance of sending all of the opponents adjacent to them flying! This means that Items that affect Spell Casting now only affect Spell Casting, as intended. Before we had some ambiguity as to what counted as a spell and what didn’t. Because of this, it was very difficult to reference spells without confusing our play-testers. Since we have now clearly separated a Spell from Spell-Like Ability, we can now reference Spells as much as we’d like. This allows us to do more with our equipment. 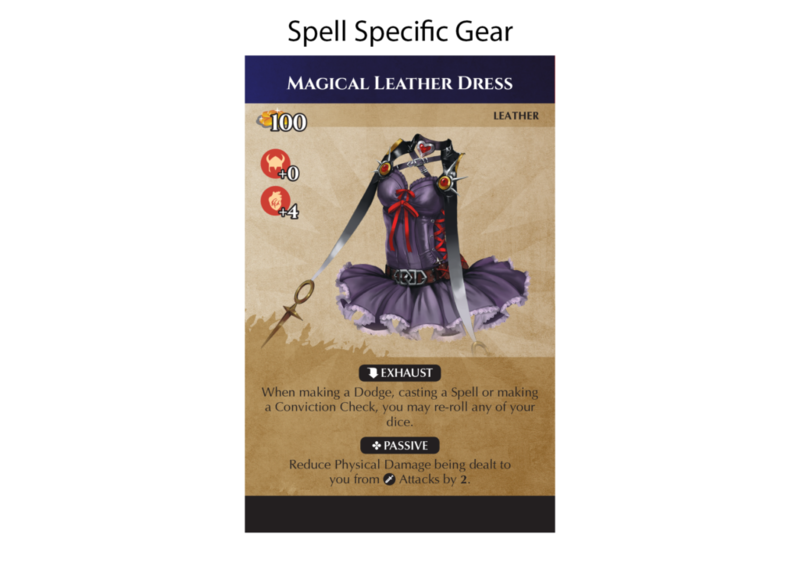 Above is an example of a magical dress that provides a bonus to Spells but can also be used with fighter-mage builds or builds that prioritize not getting hit over damage reduction. HEAVY is now an accumulative tag that reduces movement by 1 and Jump Checks by 1. On the upside, it also reduces pushing and pulling movement caused by an opponent by 1. This means an Adventurer with a HEAVY Weapon, Armor, and Accessory could stand in a raging current and not be moved by the water. They could also be pushed up to 3 spaces by an opponent’s Ability and not be moved. However, they will also reduce their base movement value by 3, and their Jump Checks by 3. Hopefully this Adventurer isn’t going to have to jump any pits! This tag is used on Command Combatants who we deem incapable of dropping any kind of loot. This might be for mechanical reasons, such as a mob that would be too easy to kill to justify the loot, or thematic reasons such as a giant ghost skull that simply has nothing to offer. 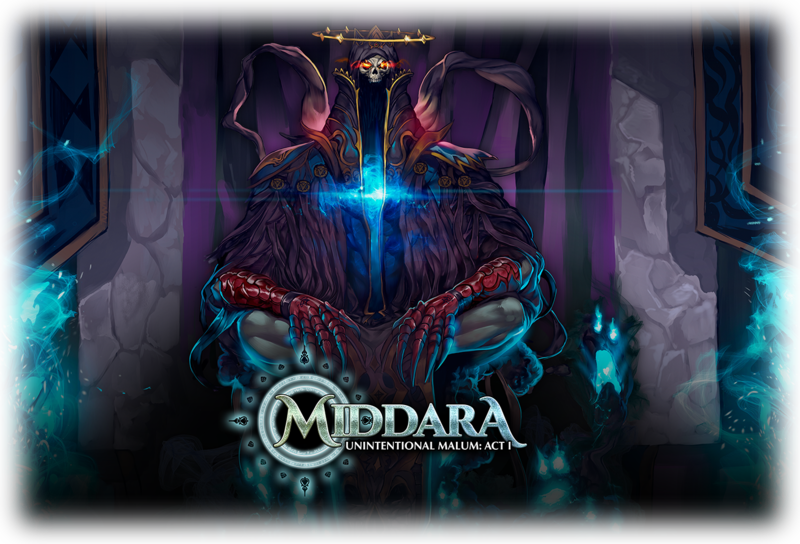 While many cards in Middara have two sides, cards without the DOUBLE tag (Like the one depicted above) are intended to be equipped using their front side being placed face up. Their back side is only ever used when their printed FLIP Ability is used. This way, players can keep track of whether or not they’ve used the Flip Ability or not. 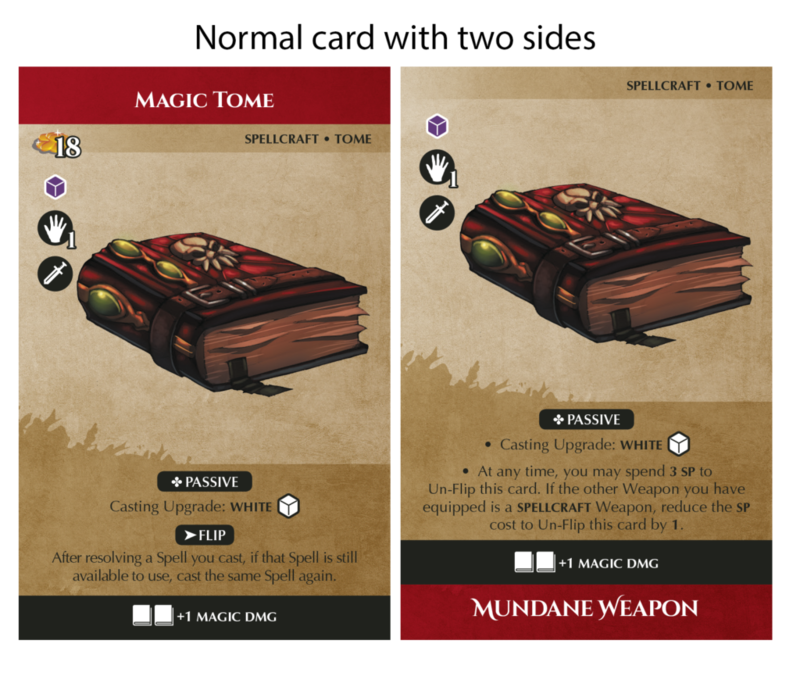 However, cards with the DOUBLE Tag are double-sided and can be equipped using either side. These cards are unique in that way. This allowed us to do a some fun things with our equipment. First off, in the above example, you can see a Long Sword. 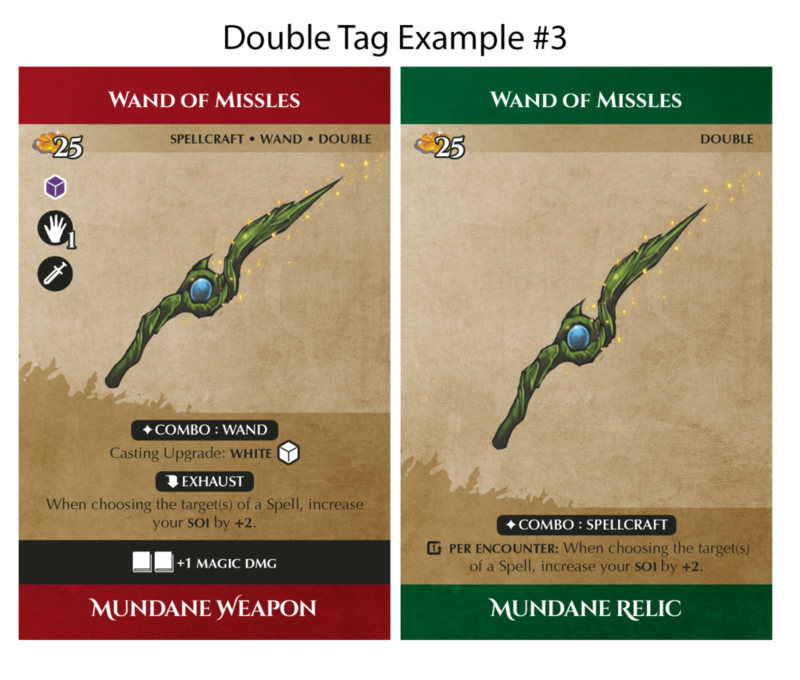 This Weapon has the DOUBLE tag and can be equipped using either side. Both sides are Weapons, however, one side is 1-handed and the other is 2-handed. This allows for a lot of versatility, giving our players the option to use Weapons in different ways creates more options for different builds. Kusarigamas are another example of Weapons with the DOUBLE tag. These Weapons can be equipped using either side, with one side being a Melee Weapon and the other being a Range 4 Weapon. Since many Disciplines in Middara can only be used with either Ranged or Melee Weapons, Kusarigamas like this one can be used by a broader range of build types. Lastly, we have DOUBLE items that can be more than one type of Item. 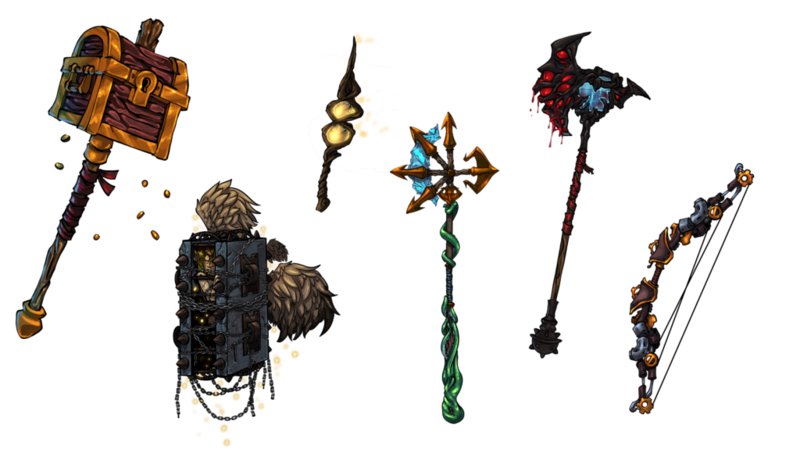 For example, the Wand depicted above can be equipped as a Weapon, or it can be equipped as a Relic. This kind of versatility not only gives players more options, but it can also keep older items that would otherwise drop off in power level more relevant during the late game meta. Before, Items were mostly a hodgepodge of what we thought looked and sounded cool. Now, we took some serious time to make Weapon types and subcategories. Above you can see two different axes. One is a Hand Axe, while the other is a War Axe. 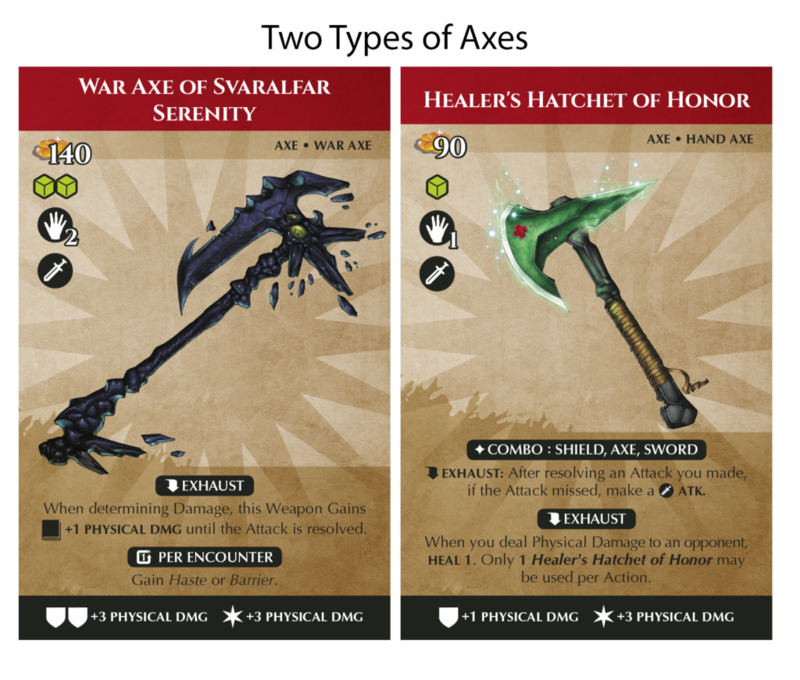 While both of these Axes are intended for different builds, and both are different types of Axes, they both have the Axe Tag and are both considered an Axe. This extends to all sorts of Weapons in MIddara. 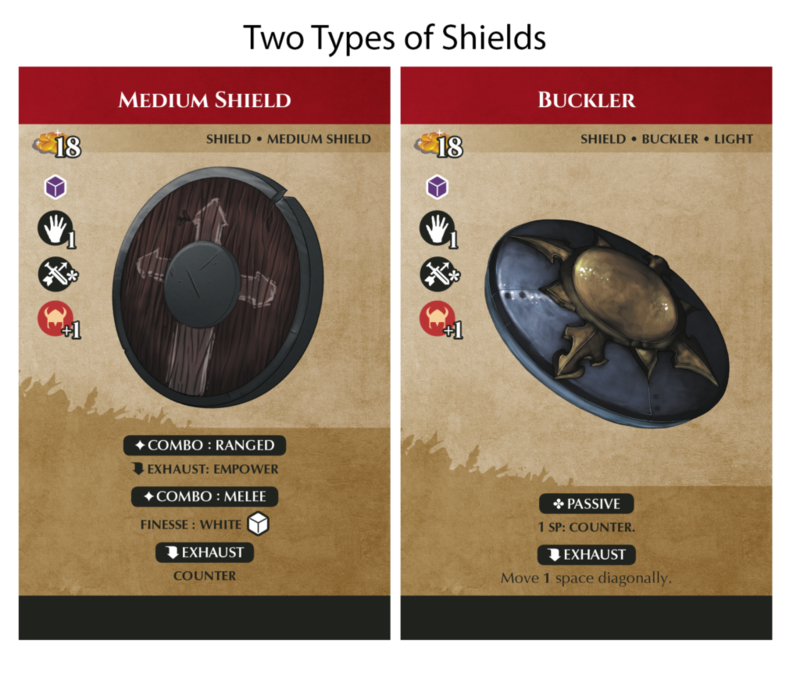 For example, both the Buckler and Medium Shield are both considered Shields. While minor, this distinction is important as we expand upon our world and refine our abilities and AI in the future. It’s also important for mechanical cohesion as players can expect similar base mechanics on certain types of Weapons. Shields provide Armor and pair in certain ways with other Weapons. These Items have a pink border and were introduced to fill in some gaps we were having when utilizing certain builds. Really, the intent of Accessories is to add more niche support roles and to allow players to add a finishing touch when tuning their builds. One of the things that makes Accessories unique is that we designed them to be useful regardless of what point of the game you get them in. Meaning that players might opt to use the first Accessory they found/purchased all the way to the end of the game, or they might constantly find something better for their build. In Middara, figures take their turns starting from the front of the Initiative Track and moving back. Once all figures have taken a turn, the round is over and a new round begins with the figure at the front of the Initiative Track taking their turn. Previously, when a figure spawned for any reason, they were simply placed at the back of the Initiative Track. While this was easy and worked well, we got lots of feedback from passionate players that the Initiative Track would eventually get stale during Encounters since it didn’t take long before you realized that nothing would spawn before your team. Certain players would even game the system to their advantage, making sure to check locations that might spawn monsters at the start of a round, then kill it with all four Adventurers before the poor monster even got a turn. To combat this, players now place the freshly spawned monster’s Initiative Card right behind their own on the Initiative Track. Then the player rolls the Black Dice. For each Shield that is rolled, the Combatant’s initiative Card is moved that many spaces towards the back of the track. This means that rolling lots of Shields is good. 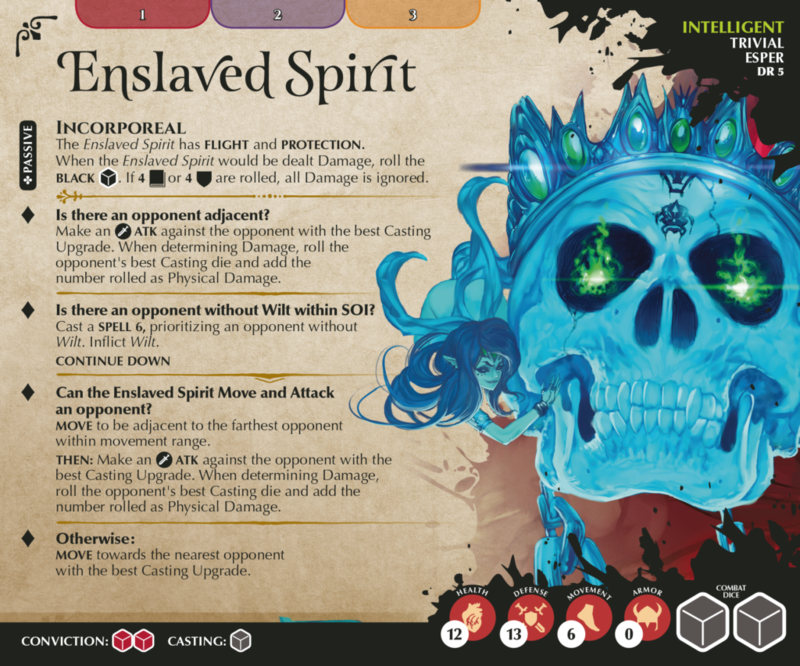 If the players rolls no shields, of the skull, then the monster will take it’s turn directly after the current figure has finished their turn. This new rule means that players can no longer guarantee that a freshly spawned monster will go last on the Initiative Track. This has made the game a lot more engaging and exciting. The second change we made was also a suggestion by public play-testers. 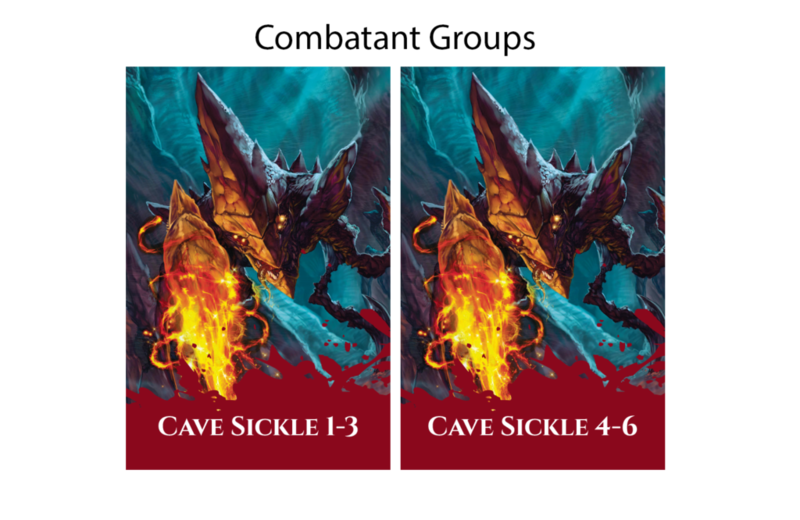 We decided to take large mobs, usually mobs that come in groups of 4 or more, and split them into two different Initiative Cards called Groups. In the above example, Cave Sickles 1-3 would all take turns at one point in the Initiative Track, while Cave Sickles 4-6 would take turns at a different time. This really shook up the stale Initiative Track and added tons of depth and strategy to our game. I’d love to give a shout out to all those who play-tested at conventions and gave meaningful feedback, these two simple changes really added a lot to the game. At around the 30 hour mark, we found that rewards from killing monsters weren’t as exciting or useful as they once were. To offset this we made it so that at particular points in the campaign, players will update the Loot Deck to contain better, higher gold value cards. 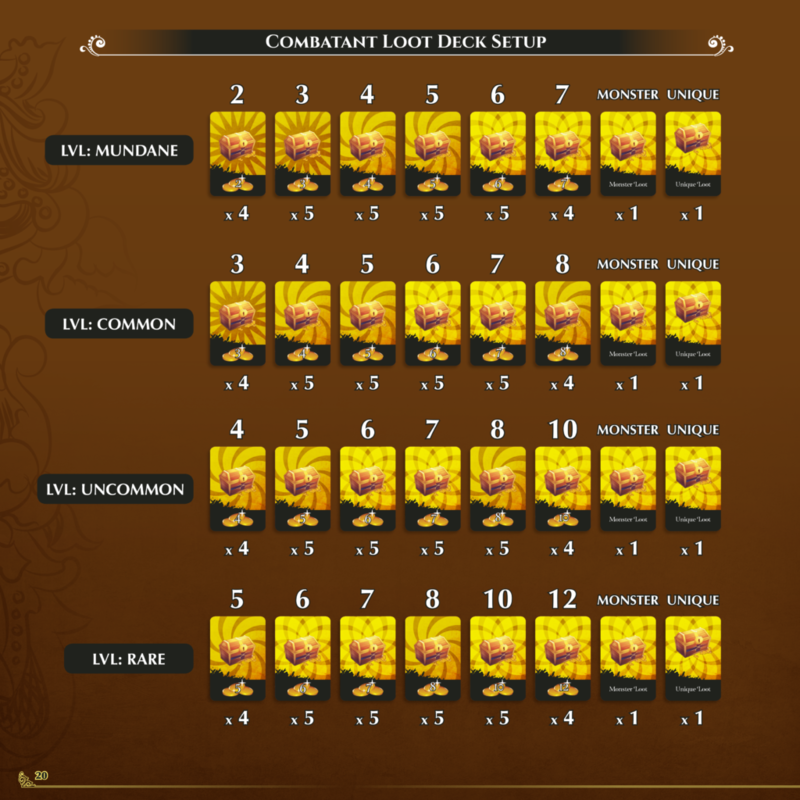 Depending on the current Loot Level, players will use a specific Loot Deck. This made killing baddies always a good idea. Over 80 pieces of artwork in fact. Most of this was new equipment. 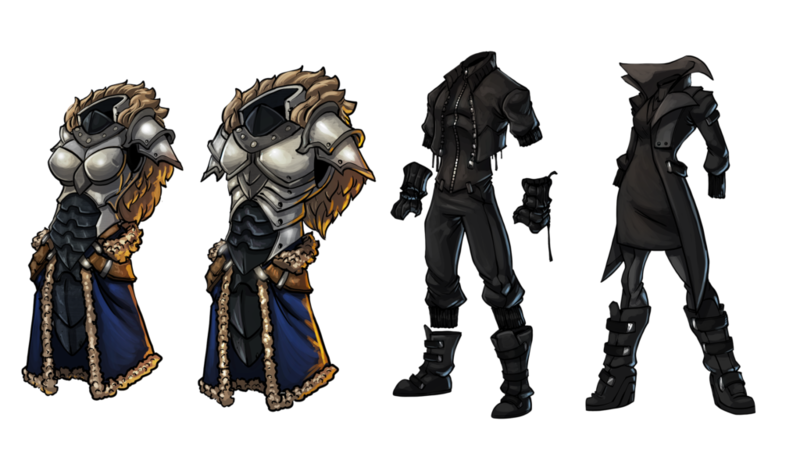 We also added some male and female variations to some appropriate items. We might’ve done more but time simply didn’t permit it. 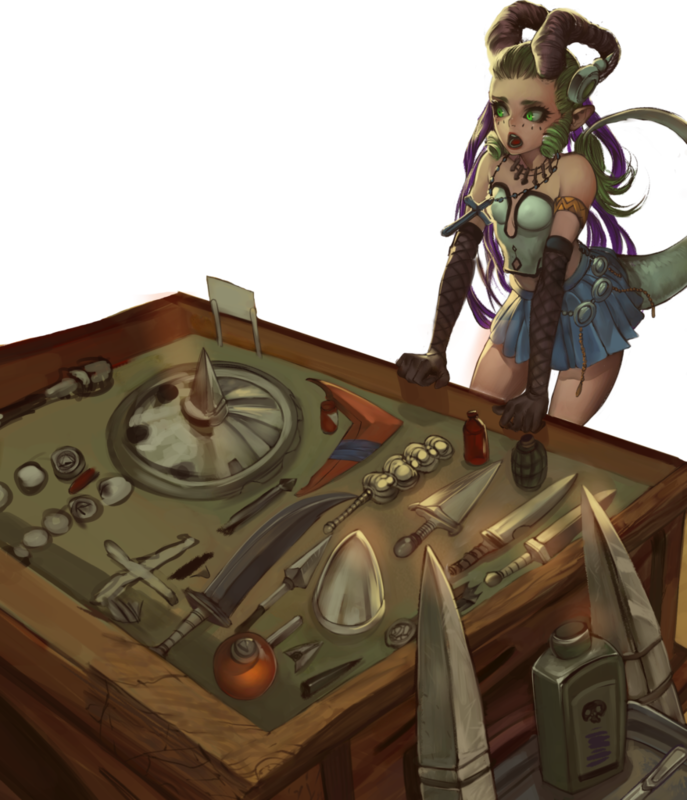 Lastly, again, thanks to play-testers, we made the starting gear in the game match the gear depicted on our character artwork a little closer. .
We always loved the idea of having a crafting system of some sort. While what we ended up with wasn’t our whole vision for crafting, it does provide some of the mechanical benefits we hoped to obtain from such a system. 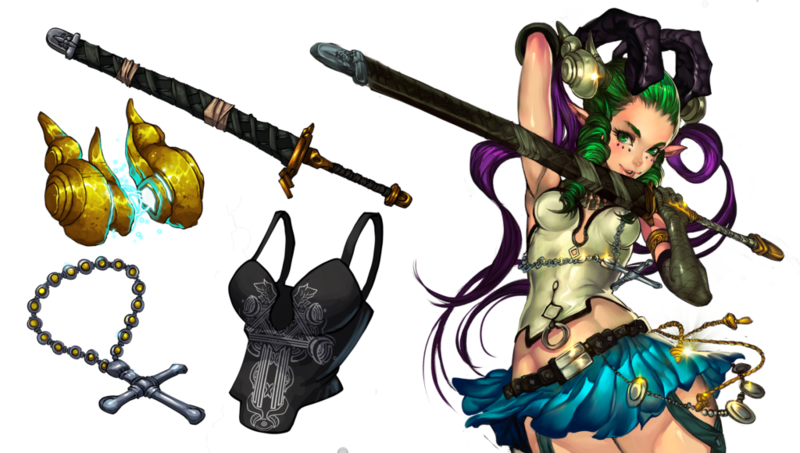 There are three main types of Item Upgrades: Weapon Upgrades, Armor Upgrades, and Core Upgrades. There are also some Item Upgrades that are a combination of two or more of the three main types. We call these Mixed Upgrades. 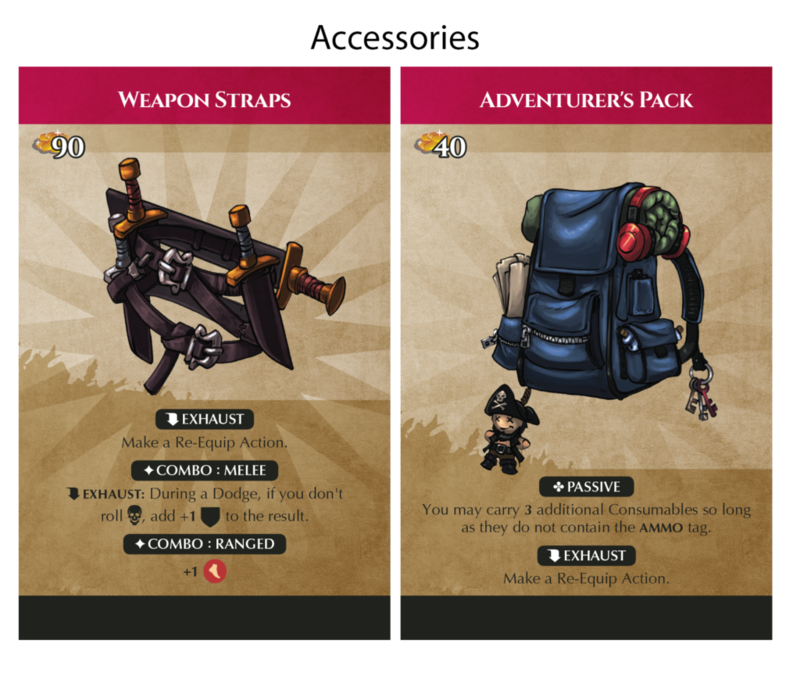 During a Story Round, players may purchase any Item Upgrades they have access to. Weapon Upgrades are placed on Weapons, Armor upgrades are placed on Armor, and Core Upgrades are placed on Cores. At the star of the Adventure, players only have access to Mundane Item Upgrades. As they reach new Loot Levels. they will unlock Common Item Upgrades, then Un-Common Item Upgrades, then finally Rare Item Upgrades. However, beyond normal Item Upgrades that are unlocked by playing through the story, players can also unlock special Item Upgrades by acquiring specific monster resources. When an Adventurer defeats a monster, draws the “Monster Loot” card from the Combatant Loot deck, that Adventurer draws a random Monster Loot Item that corresponds with the monster type they just killed. 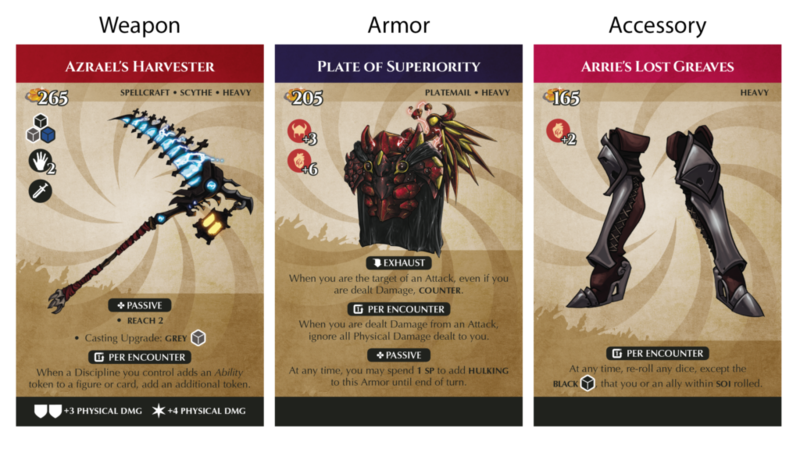 If the Monster Loot Card has the MATERIAL tag on it, the players add the corresponding set of Item Upgrades as available Upgrades during future Story Rounds. 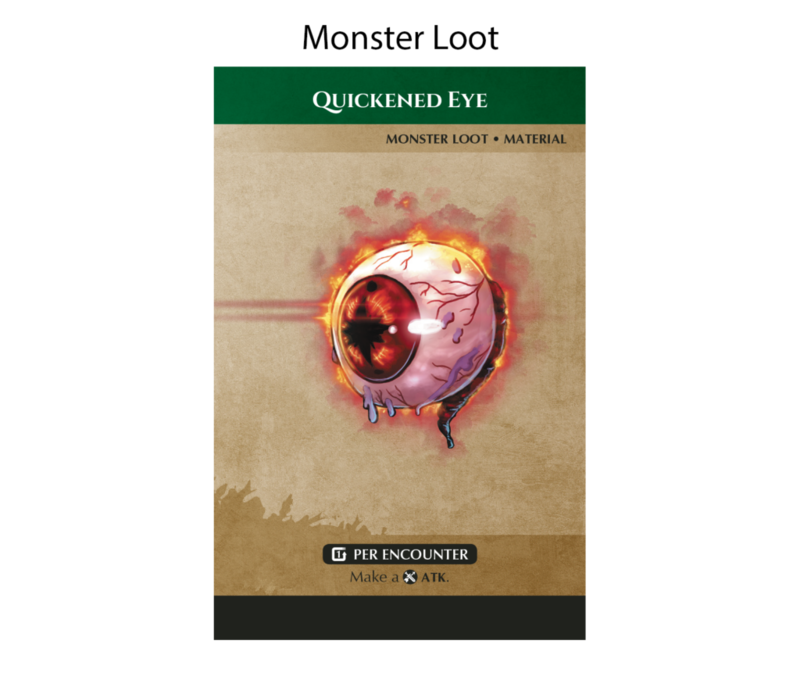 In the above example, the players killed an Animate and earned the Quickened Eye Monster Loot. 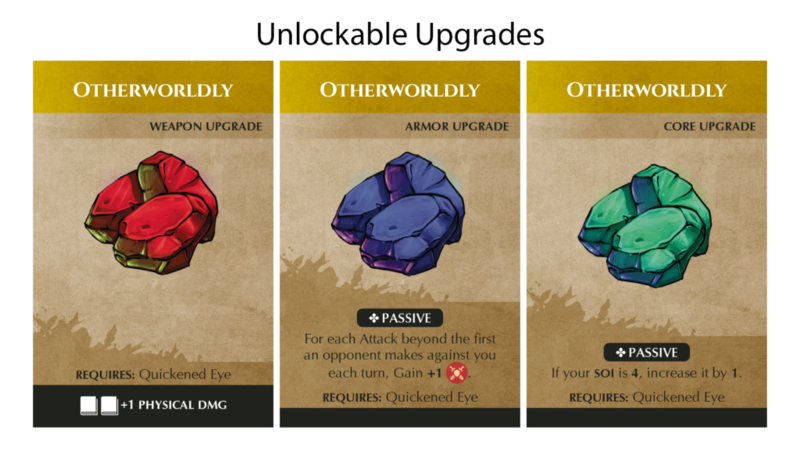 This means that the players can now purchase Otherworldly Upgrades during Story Rounds. Notice that these cards say REQUIRED: Quickened Eye. How many Item Upgrades an Adventurer can equip is limited. An Adventurer may never have more than one Item Upgrade equipped on a Armor or Core. 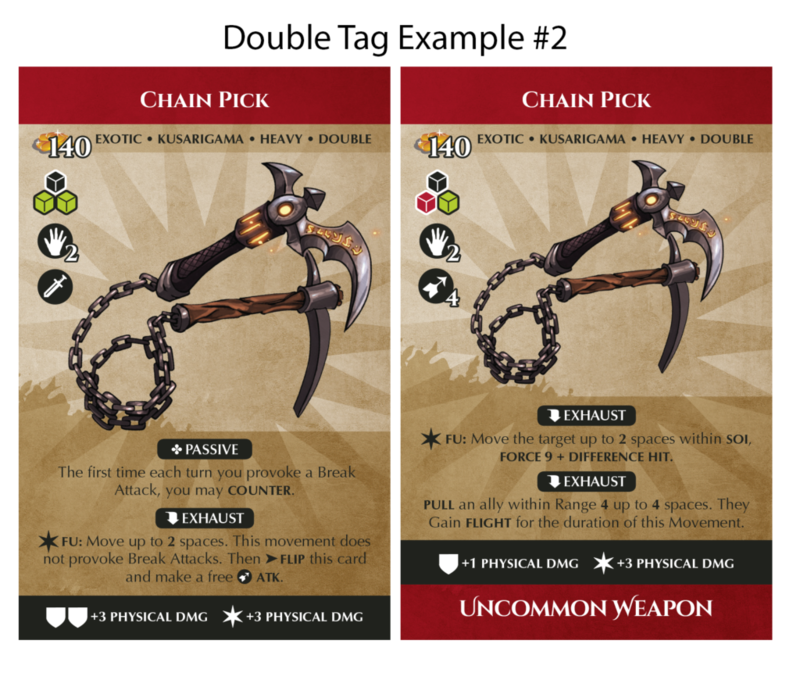 1-handed Weapons may have one Item upgrade equipped, while 2-handed Weapons may have two equipped. Due to the card size changes, and the inclusion of Accessories and Item Upgrades, we had to change the card mat. Unfortunately, a standard size card mat is actually too big to fit on the table with four people and all the rest of the pieces such as the board and tokens. So, we kept the vertical height the same as it was before and increased the horizontal dimensions to match something closer to a standard card mat. We’ll show off some samples of these new sized card mats next Friday or the Friday after. Depends on shipping times. We worked on our economy significantly. With all the new Item types, Accessories, and upgrades we were able to make damn sure that our players will never actually reach that scrumptious carrot we’re dangling in front of them during a playthrough. Instead, players should find themselves constantly striving for better gear and better abilities over the entire course of our 60+ hour game. However, due to the complex nature of economy and balance, we’re excited to get feedback on economy once the game has finally been delivered and take notes from our backers. We got rid of our blade, impact, and thrust damage modifier system. Now, resistances, immunities, and other effects will only refer to Weapon types, such as Axes and Swords, or damage types such as Melee and Ranged. This was propagated to our Items and Combatants, greatly streamlining our combat by trimming away some of the unnecessary bulk. Despite it being simpler, we were still able to keep the thematic feel and mechanic requirements on every one of our monsters. 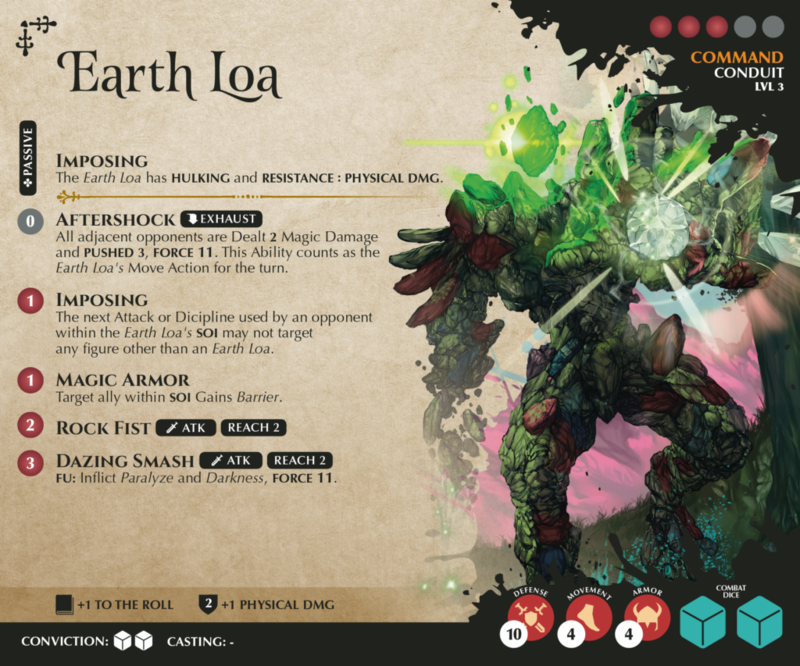 In the above example the Earth Loa is now simply resistant to physical damage instead of just Blade Weapons. In the above example of the Earth Loa, you may have noticed the HULKING tag. This new tag means that the monster cannot be moved by opposing Abilities or currents for any reason. I mean… it’s a big rock monster. 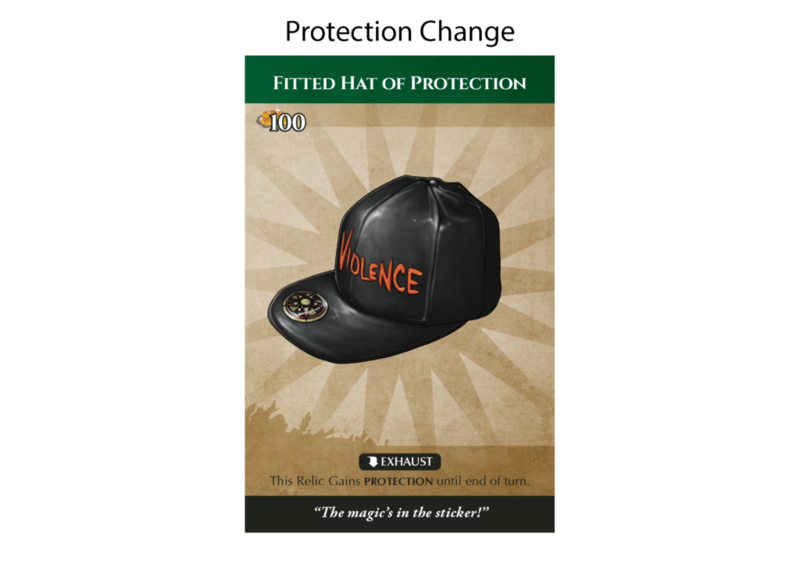 Items that grant protection now add a Black Die when rolling for Conviction Check against a Spell. For each Book rolled on the Black, the player adds +1 to the roll. Phew, okay. That’s all the basic changes. We made some more subtle changes but you’ll have to read through the rule book if you want to catch them all. ← For the Love of Lore!